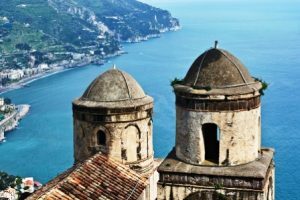 Perched high above the Amalfi Coast, in the southern facing cliffs of the Sorrento Peninsula, sits Ravello, a lovely little village to visit while on a yacht charter cruising along the Amalfi Coast. On a crewed yacht charter of southern Italy, the southern coastline of the Sorrento Peninsula, the Amalfi Coast, is a must do cruise after a stop in Capri. And when visiting the Amalfi Coast on a crewed yacht charter, head ashore by ships tender to the village of Amalfi and jump in a taxi or for the vigorous, climb the mountain steps to the village of Ravello for a stunning view of the Amalfi Coast and your charter yacht on anchor below. 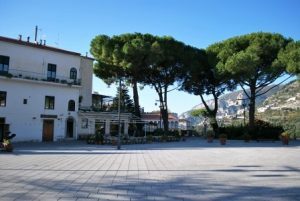 Ravello is well worth the time to visit, not just for the outstanding view of the Amalfi Coast that is hard to replicate, but also to explore this little village of less than 2500 people with a lovely central piazza. Ravello was first founded in the 5th century high up in the cliffs overlooking the Amalfi coast as a refuge against invading barbarians. 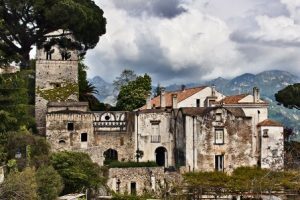 Soon Ravello flourish and for many centuries was the center of wool gathering and weaving in the area becoming an important trading town. In 1270, Villa Rufolo was built just off of the central piazza by Nicola Rufolo, a wealthy merchant of Ravello. 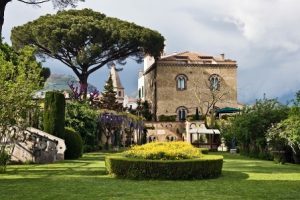 In the last several centuries, Ravello has become a haven for artists, musicians and writers seeking the beauty of the area for inspiration, including Richard Wagner, M. C. Escher, Giovanni Boccaccio, Virginia Woolf, Gore Vidal, André Gide, Truman Capote, Tennessee Williams, Graham Greene, and Sara Teasdale. Richard Wagner was said to have been inspired to write his “Parsifal” by the view from the gardens at the Villa Rufolo. 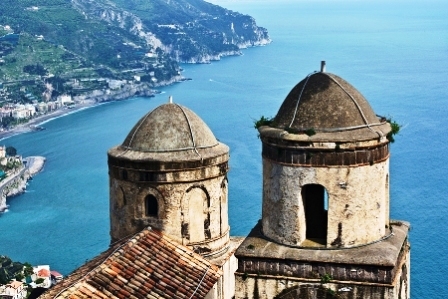 Whether by taxi or a brisk hike, arrival in Ravello is into the central Piazza Vescovado, overlooking the Amalfi Coast on one side and ringed on the other sides by the entrance to the Villa Rufolo, the Duomo (cathedral) of Ravello, and artisans’ shops. About a 5-10 minute walk from the piazza are the gardens of the Villa Cimbrone, open to the public for a fee and offering spectacular views of the Amalfi Coast. The gardens of the Villa Rufolo are also open to the public for a fee, and here perched on the stone balustrade overlooking the Amalfi Coast are the busts featured in so many photos of the Amalfi Coast. The gardens of the Villa Rufolo are also home to an evening summer concert series of classical music from July through September. Check in advance if you will be in the area for tickets to one of the concerts and spend a delightful evening, high above the Amalfi coast enjoying a classical music concert featuring world class musicians. 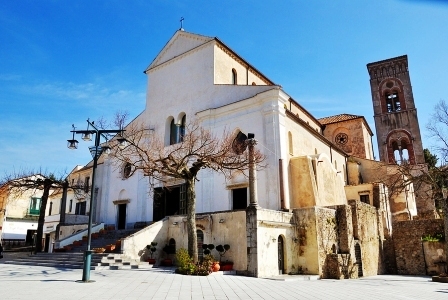 While visiting Ravello, be sure to visit the Ravello Duomo with the Moroccan styled courtyard and gardens. First constructed in 1086, and dedicated to the village patron saint, San Pantaleone, this cathedral is a jewel of Romanesque architecture. And take time to explore the various little shops many featuring hand painted pottery before descending back down to the coast where your crewed charter yacht awaits.